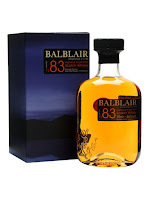 Got a quick Balblair review for you today, which fits nicely with the vertical I did ages ago. As I’ve said before, it’s underrated, natural whisky. Apologies but pic is of the 1st release, but this one would be the most recent. Nose: Seems a little closed but definitely classic Balblair from my experience. Vanilla, light fruit, oak, light spice. Taste: Quite full on the taste, biscuit, custard, oak, spice, vanilla, good balance. Building spice and oak. Finish: Long length. Classic Balblair, coconut and vanilla, oak. A lovely natural progression to the range I’ve tried, all from Bourbon barrels of increasing ages. All showing a really nice natural style. This is pretty reasonably priced for a 30 year old but if you are a fan of light whisky, you’ll like this. Personally I prefer them heavy as they go but I can appreciate the other side of the coin too.